TACLOBAN CITY – Pedro A. Noval Jr. bids goodbye on August 10, 2016 (Wednesday) as Regional Director of Department of the Interior and Local Government (DILG) in Eastern Visayas after 41 years in government service. Director Noval, who rose from the ranks, said that his most fulfilling accomplishment is helping the region rise from the devastation of Supertyphoon Yolanda (Haiyan) nearly three years ago. Today, nearly 100% of the first batch of projects for repair of municipal and city halls, markets and civic centers have been completed, while more than half of barangay facilities have been completely rebuilt or repaired, and the remaining projects are nearly completed. Likewise, Director Noval assisted then-DILG Secretary Manuel Roxas in the relief and recovery efforts right after the typhoon. Director Noval proudly notes that aside from looking after the rehabilitation of LGU facilities, he helped ensure that damaged office structures of DILG were not neglected. A mechanical engineer, Director Noval supervised the rehabilitation of the DILG-8 regional office which houses the Training Center and Local Governance Resource Center in the second floor, motorpool, records room and. supply room as well as construction of Wellness Center, Guardhouse, Power Generator, Dormitory, and the two-story DILG Leyte and DILG Tacloban City offices. The employees’ dormitory will save the office funding in the long-term by providing field officers and Central Office staff accommodation instead of having to billet them in hotels. Under his term, the traveling allowance for field officers was increased 300%. All provincial offices in the region have been provided service vehicles, and funds were also downloaded for construction of DILG provincial offices. Other legacies attributed to RD Noval include: the Local Government Performance Enhancement through Teamwork (LGPET) strategy to promote employee productivity; conduct of the Yolanda Heroism Award and DRRM Summit during the past two anniversaries of the supertyphoon; improvement of office environment and systems through the adoption of the 5S Program; Call Center and One Note System; the Build Back Better Operations Manual (BBBOM); organization of the DILG-8 Employees’ Cooperative; and a program on Journeying Towards a Righteous Employee, among others. RD Noval further remembers that he was able to visit all 143 municipalities and cities in the region, including far-flung island towns, during his more than four years stay in Eastern Visayas. His close interaction with local officials enabled the region to attain 100% compliance to the DILG Full Disclosure Policy months after he assumed office in 2011. His good relationship with local officials though, did not prevent him from religiously implementing office policies as well court decisions against local officials to the letter. A native Cebuano, Director Noval has a Doctorate Degree in Management major in Human Resource Management, and is an Outstanding Alumnus of the University of San Jose Recoletos, Cebu. He started as a Barangay Development Worker of then-Department of the Local Government and Community Development (DLGCD) in 1975, after successfully completing the six-month Pre-Service Training Course for Barangay Development Workers where he was awarded as one of the Ten Outstanding Graduates. He served as Municipal Development Officer, Assistant Provincial Director (Siquijor), Assistant City Director (Mandaue City), Regional LGA Coordinator, Division Chief, Provincial Director of Cebu Province, Asst. Regional Director for nine (9) years, Regional Director of DILG-7 from 2007 to 2011, and finally as Regional Director of DILG Region 8 from 2011 to 2016. Director Noval has the distinction of being appointed OIC-Municipal Mayor in Liloan, Cebu in 1987-1988, and as OIC-Mayor of the Municipality of Compostela from July 2010 to October 2011, following the suspension by the Commission of Elections (COMELEC) of the effect of the proclamation of the town’s elected officials in the 2010 polls. His vast experience in government saw him attending various training programs in Canada, South Korea, Malaysia, Japan, Thailand, Cambodia and Vietnam among others that were sponsored by DILG, other agencies and training institutions. He is highly recognized in other areas of government work. He was elected as President of the Association of Regional Executives of National Agencies (ARENA-7) in Central Visayas, and as Vice President for the Visayas of the National Union of Career Executive Service Officers (NUCESO). Workaholic by nature, RD Noval now relishes the extra time he will have with his family, aside from being able to pursue farming in Southern Leyte and teaching part-time in Cebu. Director Noval will be succeeded by Director Marivel C. Sacendoncillo, a native of Villareal, Samar. RD Sacendoncillo will serve as Director of DILG-8 in concurrent capacity as Executive Director of the DILG Local Government Academy (LGA) to which she has been connected for 28 years. Bishop of Calbayog Most Rev. Isabelo Abarquez warmly welcomed by MGen. Jet Velarmino and the Division Staff during his arrival as Guest of Honor and Speaker on the 8ID's 28th Founding Anniversary celebration on August 1, 2016. CAMP LUKBAN, Catbalogan City – The 8th Infantry (Stormtroopers) Division, Philippine Army, marked its 28th Founding Anniversary with the theme, "8ID at Sambayanan, Dalawampu't Walong Taon Kaagapay ng Mamamayang Tungo sa Kapayapaan at Kaunlaran ng Sambayanan" at Headquarters in Camp General Vicente Lukban, Brgy. Maulong, Catbalogan City, Samar on August 1, 2016. The kick-off of the 28th Founding Anniversary started with a series of events such as: Trail Bike Challenge; Badminton Challenge; Squad Challenge; Tactical Challenge 2; Ethnic Variety Show; Wreath Laying Ceremony; Awarding of Medals and Plaque of Recognition to the soldiers and civilian stakeholders, including formal dinner with military officers and senior NCOs to include LGUs, CSOs and Non-Government Agencies who supported the 8th ID in attaining lasting peace in the Region. The event was highlighted with a wreath-laying ceremony led by Most Rev. Isabelo C Abarquez D.D, Bishop, Calbayog City and Major General Jet B. Velarmino, Commander 8ID, in honor to the fallen comrade-in-arms and in recognition of the soldiers' heroism and ultimate sacrifice in pursuit of peace in Region VIII. The ceremony was attended and witnessed by the soldiers' loved ones, officers, soldiers and civilian employees of the Command. Another highlight of the activities was the awarding to deserving personnel who have shown meritorious achievement in both combat and non-combat role that significantly contributed to the overall success of the Command's mission. In addition, civilian stakeholders, who contributed to the accomplishments of the Command mission, namely: Hon. Ronald Aquino of Calbayog City; Mr. Harry Rhumor, Mr. Vince Yulo, Mr. Alvin Lao Hoo, Ms. Christine Caidic of Multi Sector Advisory Board, Director Edgar Posadas of Office of the Civil Defense Region 8, Shintaro Palermo, Sherlock Codilla, Senior Manager for security of the Philippine Associated Smelting and Refinery (PASAR) were also awarded with plaques of recognition during the event. Gracing the 28th Founding Anniversary of 8ID were the presence of Most Rev. Isabelo C Abarquez, Bishop Diocese of Calbayog City as the Guest of Honor and Speaker; Major General Jet B. Velarmino, Commander 8ID; Hon. Sharee Ann Tan- Delos Santos, Governor of Samar represented by Hon. Jimboy T. Tan, Vice Governor of Samar; Brigadier General Herminigildo C. Aquino, former 803rd Brigade Commander; Brigadier General Leoncio A. Cirunay, former Commander, 801st Infantry Brigade and Brigadier General Dinoh A. Dolina, former Commander, 802nd Infantry Brigade and media personalities. 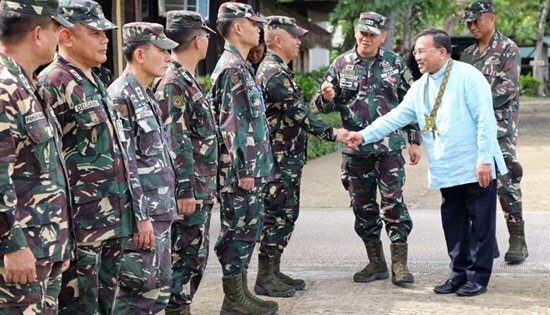 Major General Velarmino, said that the Command has accomplished much in performing its mandate task of protecting the people and the communities, because of the soldiers for peace. On the other hand, Most Rev. Bishop Abarquez said, "It is my prayer that our Philippine Army will continue to serve with honor and integrity for God, Country and people." Your Philippine Army will continue to uphold its unwavering commitment as the protector and servant of the people not only in Eastern Visayas but to the Filipino as a whole. QUEZON CITY – The Samahan ng mga Ex-Detainees Laban sa Detensyon at Aresto (SELDA), an organization of former political prisoners and initiator of the historic Hawaii class action suit against the Marcoses, expresses outrage on the decision of Pres. Rodrigo Duterte to bury the remains of dictator Ferdinand Marcos at Libingan ng mga Bayani. SELDA calls on Pres. Duterte to reconsider his decision. Burying Marcos at the Libingan ng mga Bayani is an affront to the Filipino nation, especially the millions who fought and the countless who died and disappeared fighting Marcos tyrannical rule. The move, if pursued, constitutes another act of gross injustice to the nation and tens of thousands of victims of extrajudicial killings, enforced disappearances, illegal arrests and detention, torture and harassment perpetrated by the Marcos fascist regime. Not a single martial law victim has ever received any reparation, in line with the three-year implementation of the Human Rights Victims Reparation and Recognition Act of 2013 (Republic Act 10368). Instead of rendering a component of justice through indemnification, a hero’s burial for Marcos will dishonor the victims by kowtowing to the whims and caprices of the Marcos family to bury a murderer and plunderer with honors. The Marcoses and their ilk, who escaped from the country with the aid of the United States, are now partly back in power using portions of the $10 billion they plundered from the nation’s coffers and their political connections with the ruling elite. Despot Marcos, a murderer and a plunderer, is not a hero, and it is the height of historical revisionism to give him full national honors as a hero. History has already rendered verdict to Marcos, when millions of Filipinos rose to overthrow his tyrannical regime. What lessons do we teach our children by treating Marcos a hero? That it is correct and even heroic to steal, murder, and torture? No. Evil must be repudiated. Injustice must end. SELDA calls for the most expedient efforts to indemnify the thousands of victims of Marcos’ martial law, which is an actual substantial step towards justice for the martial law victims and their families. Most importantly, we call on the people here and abroad to speak and stand for justice and press Pres. Duterte to reconsider his assailed decision and instead give justice to the victims of Marcos abusive rule. 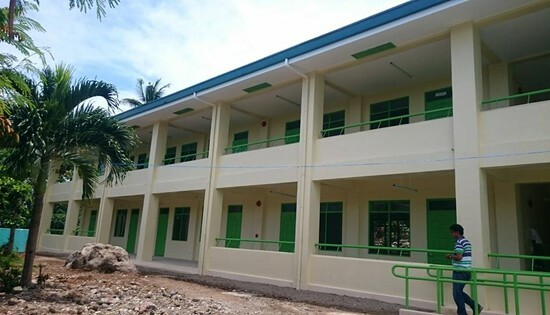 The newly completed construction of 2-storey 6-classroom Senior High School Building at Almeria National High School, Almeria, Biliran. The project was under contract with CNE Construction with a contract cost of P8,214,965.05. The completed project will be utilized by more or less 240 Senior High School students. 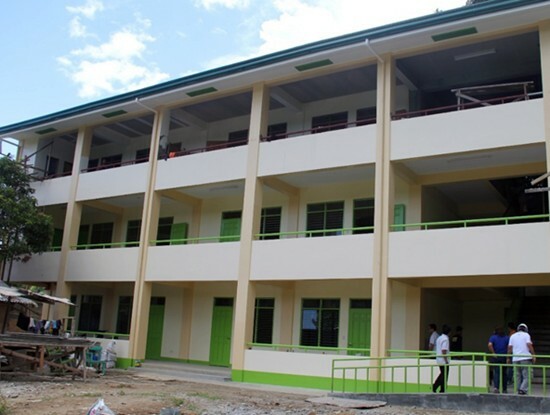 BILIRAN – The Department of Public Works and Highways (DPWH) - Biliran District Engineering Office (BDEO) is target to finish all Senior High School buildings in the entire province of Biliran by August or September this year. District Engineer, David P. Adongay Jr. during the Kapihan: Pulong-pulong ng Bayan on Radyo Natin FM said that the target completion of the school building projects which supposedly be finished by June before opening of classes was extended due to the failure of the sub-soil exploration test. Engr. Adongay clarified that the completion of the Senior High School Buildings are dependent on the result of the subsoil exploration test and the release of the additional funds. Engr. Adongay points out that the main problem in the implementation of school building projects are the site identified by the DepEd. The district engineer suggested that DPWH and DepEd should have a joint evaluation and identification of building sites because its terrain is one to be considered in the budget allocation. “Kaya dapat talaga sa identification palang ma-identified namin kung ano talaga ang dapat tatrabahuin diyan for example yung leveling, yung scope of work sa excavation, aside sa subsoil exploration,” Engr. Adongay said. As of July, 2016, Engr. Adongay reported that Biliran DEO have already posts 59.43% for the school building projects. Out of the 30 school buildings projects, 11 are already completed, 4 not yet started, 5 are still on-going and 10 are substantially completed. Adongay explained that they still didn’t allow classes to hold on those substantially completed buildings to ensure the safety of teachers and students. “Nagawa na namin yung revise kaya lang walang pondo, ang required sa amin ay completion talaga nang buong building mahirap naman gagawa tayo diyan tapos walang ceiling, pintura, parang hindi maganda. At least yung dini-deliver namin na school building yung conducive to learning at maganda talaga,” said Engr. Adongay. 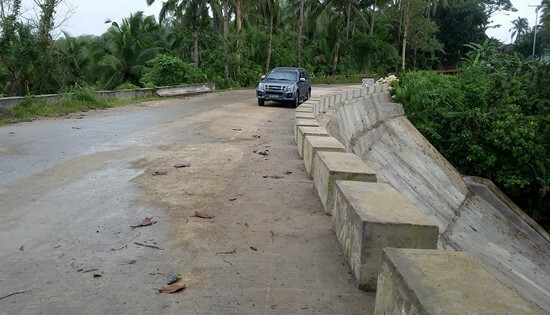 TARANGNAN, Samar – No more bumpy rides from Barangay Balugo to the town proper after the Department of Agrarian Reform (DAR) rehabilitated the more than 10-kilometer road. Last week DAR Regional Director Sheila Enciso formally turned over the rehabilitated Balugo-Imelda road to Mayor Danilo Tan for the local government unit’s (LGU’s) maintenance of the said project. Enciso disclosed that the project was implemented under the Program Beneficiaries Development component of the Comprehensive Agrarian Reform Program (CARP) thru DAR’s second phase of the Agrarian Reform Communities Project (ARCP-II) funded by a loan from the Asian Development Bank. The total project cost, according to her, amounted to P25.4 million. However, the amount was shared by the LGU shouldering P14.6 million, while the remaining P10.7 million was funded by ADB, she added. During the said occasion, Enciso explained to the recipient LGU the latter’s responsibility in the maintenance of the project. She stressed that if properly maintained in good condition within 10 years, the loan will be converted into a grant. Included in the rehabilitation were spot concreting of about 6.5 kilometers and the construction of slope protections to prevent soil erosion that may lead to eventual damage of the road. Meanwhile, as Mayor Tan thanked DAR for the rehabilitation of the Balugo-Imelda road, he disclosed this town having been a recipient too of another road project under ARCP-I in the past. He further added that they are hoping more blessings from DAR be poured to their municipality as there are still many roads that need repair. Provincial Agrarian Reform Program Officer (PARPO) Leovigildo Monge said that the project was implemented in the Cambatutay Agrarian Reform Community (ARC) passing through the Barangays of Balugo, Bahay, Gallego, Camunghan and Imelda. According to him, it will be benefited by the more than 2,700 population in this area where 286 are agrarian reform beneficiaries (ARBs). Enciso also said that agricultural production and farmer’s income are expected to increase now that transportation of their products for trading will be much easier with the improved road. VILLABA, Leyte – “This is a dream come true!” thus said Barangay Sambulawan Chairwoman Tessie Mayot during the turnover rites of the rehabilitated farm-to-market road in her village leading to the national highway. 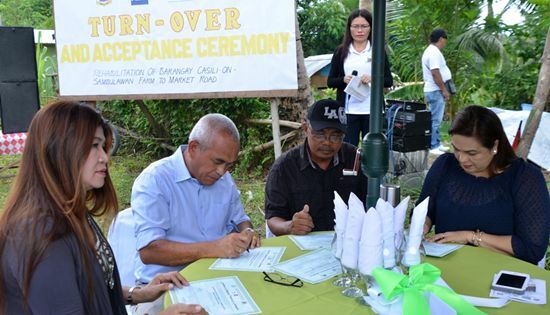 On Friday, Leyte Provincial Agrarian Reform Program Officer-II (PARPO-II) Renato Badilla turned over to the local government unit (LGU) the 3.42-kilometer rehabilitated road in Barangay Casili-on going to Barangay Sambulawan in this town. Mayor Juliet Larrazabal said that with the rehabilitation of this road, farmers in this area will now find it easy transporting their harvests to the town proper for trading. But to Barangay Chairwoman Mayot who was elated with the completion of this project, stressed the comfort and safe travel of her constituents and those from Barangays San Francisco, Capiñahan, New Balanac and Cahigan who are likewise passing this way, aside from the easy transportation of their products, now that this road has been improved. She narrated the discomfort and risk they experienced since her childhood days when passing thru the spillway during rainy days. According to her water overflows in the spillway that they had to lift their skirts not to get wet. They dreamed this road would be repaired but never thought it would be realized until the Department of Agrarian Reform (DAR) thru the second phase of the Agrarian Reform Community Project (ARCP-II) took responsibility of it. DAR-8 Regional Director Sheila Enciso explained that Barangays Casili-on and Sambulawan are part of the Villaba agrarian reform community (ARC) with 2,178 agrarian reform beneficiaries (ARBs) which qualified them for this project. Aside from the ARBs, more than 3,000 population from six barangays are estimated to benefit too from this project implemented under the Program Beneficiaries Development component of the Comprehensive Agrarian Reform Program (CARP), she added. Badilla meanwhile disclosed that the total cost of this project is P11-million with P4.7-million loaned from the Asian Development Bank (ADB), while P6.3-million was shouldered by the LGU. He emphasized to the recipient LGU the latter’s responsibility in the maintenance of the said project. According to him, if properly maintained in good condition within 10 years this project will be converted into a grant. CALBAYOG CITY – Oquendo National High School three (3) storey - four (4) classroom school project is up for completion by the end of July 2016 based on the recently conducted project inspection by District Engineer Alvin Ignacio and the District Inspectorate Team headed by Assistant District Engineer Loreto M. Cedro, Department of Public Works and Highways (DPWH) - Samar First District Engineering Office (SFDEO). Present during the ocular inspection is Mr. Melaner Oyoa, School Head. The project is appropriated P10,417,131.51 under the Fiscal Year (FY) 2015 Basic Educational Facilities Fund (BEFF). The project covers structure excavation, embankment, reinforcing steel, structural concrete, and masonry, carpentry (dry wall partition), termites control, steel, roofing, ceiling, finishing, painting, plumbing, sanitary, tile and electrical works. Construction activities kicked-off October 2015. A total of 166 high school students, 74 males, 92 females, are already benefiting the project as classrooms in the first and second floors are already used in conducting classes since Monday, July 25, 2016. School Head Oyoa said that students and teachers had been conducting classes at the school grounds and stage since the start of classes. “Only one room will not be used by the students but we will be utilizing it as our Computer Room”, said Oyoa. He expressed his gratitude to the DPWH personnel for their visit and advice that some classrooms are ready for occupancy. DE Ignacio, ADE Cedro and members of the inspectorate team meticulously inspected the building if truly the contractor conformed to the standards and specifications of the department. They also instructed the contractor’s construction foreman present during the inspection concerning plumbing and ceiling works. Construction is ongoing during the site visit. 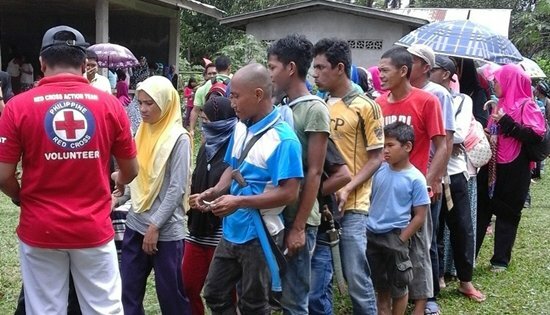 MANILA – Armed fighting between government security forces and non-state armed groups since the first week of July has caused the displacement of around 3,400 families in Basilan Province, southern Philippines. The affected families in Tipo-Tipo, Al-Barka and Ungkaya Pukan municipalities have sought refuge with their relatives after shelling and air strikes occurred on an almost daily basis over the past three weeks. Casualties and injured fighters were reported on both sides, while a few civilians were also wounded as a consequence of the clashes. “The security situation in Basilan is precarious. We are concerned for the civilians as we expect clashes to continue in the coming weeks,” said Yann Fridez, head of the International Committee of the Red Cross (ICRC) sub-delegation in Mindanao. “We urge all parties to the fighting to exercise utmost precaution to minimize the impact or damage to civilian communities. We also ask them to spare civilian structures such as hospitals, schools and houses, and facilities that are essential for their daily lives,” he stressed. To complement the assistance provided by the authorities, the ICRC, with the Philippine Red Cross (PRC), distributed essential household items to more than 17,000 displaced people in the three municipalities. The items distributed by the PRC Basilan chapter on July 27-28 included hygiene kits, blankets, towels, jerry cans, mosquito nets and sleeping mats. The ICRC also distributed dressing kits and medical supplies including drugs and anti-tetanus vaccines to enhance the capacity of rural health units in these three municipalities to treat sick and wounded people. Already in April, the ICRC and the Department of Health-Health Emergency Management Bureau had conducted Basic Life Support training for 168 health staff in Basilan and Sulu provinces. The ICRC is a neutral, impartial and independent humanitarian organization whose mandate is to protect and assist people affected by armed conflict and other situations of violence. It has had a presence in the Philippines for more than 70 years and a permanent presence in Mindanao since 1982.